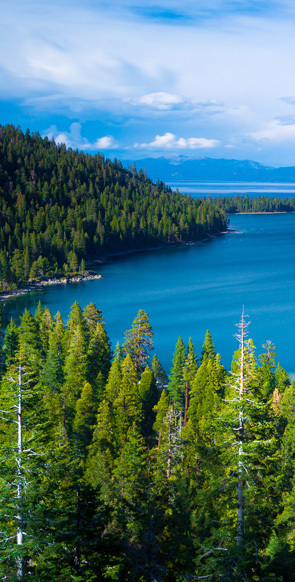 The lakes of South Lake Tahoe, while dwarfed by the much larger Lake Tahoe, are beautiful, cold, often deep (and sometimes shallow), and have interesting developmental histories. Most were carved out by glaciers during the last Ice Age. There are many large and small that can be reached via a short hike in summer and by snowshoe or cross-country skis in winter. Your best source of information is the Forest Service, of course, but here's an introduction to several of the larger and more popular destinations. All of the trailheads from which these places are reached are within a few miles of the 3 Peaks Resort and Beach Club. Fallen Leaf Lake is about one mile south of Lake Tahoe and is reached by a single lane road, Fallen Leaf Road. There are wide spots in the road to allow vehicles to pass in each direction. The road intersects Highway 89 about 5-1/2 miles to the west of downtown South Lake Tahoe. The lake is almost 3 miles long (north-south) and almost 1 mile wide (east-west). Despite the rather limited access via the single lane road, there are a number of private residences on the lake, most with boat docks. This is a great area to have a picnic or do some hiking. Wakeboarding, water skiing, and fishing are popular lake activities. The community of Echo Lake is about 12 miles south of South Lake Tahoe. The Lower and Upper Echo lakes are actually connected by a narrow body of water which is, however, only passable when water levels are high. In the winter the area is highly popular with cross-country skiers as the terrain is moderate and access from South Lake Tahoe is easy. Snowmobiles are never allowed except for local residents. The Echo lakes are one of the preferred starting points for summer hikers, winter showshoers, and cross-country skiers to hike or glide into the Desolation Wilderness. To do that however, depending on how long and far you intend to travel, you may need a Wilderness Permit which you can obtain from the Forest Service. Avalanches are a real problem in this area, so again, check with the Forest Service and be aware of your surroundings. Lake Aloha, Suzie Lake, Heather Lake, Horsetail Falls, Grass Lake, and Gilmore Lake are all accessible by visitors via hikes of under six miles from the Glen Alpine Trailhead (take Fallen Leaf Road from Highway 89) or Echo Lakes Trailhead (Highway 50 south to Echo Summit then onto Johnson Pass Road). Also, you might want to check out Tamarack Lake and Triangle Lake. In all cases, if you're not already familiar with the local terrain and weather, it is recommended that you contact the Forest Service at the Taylor Creek Visitor Center.